I love sheet masks. Well, masks in general. I especially love sheet masks because they do so much in such a small amount of time. The Koreans invented sheet masks and thank goodness they did. It was a great invention. 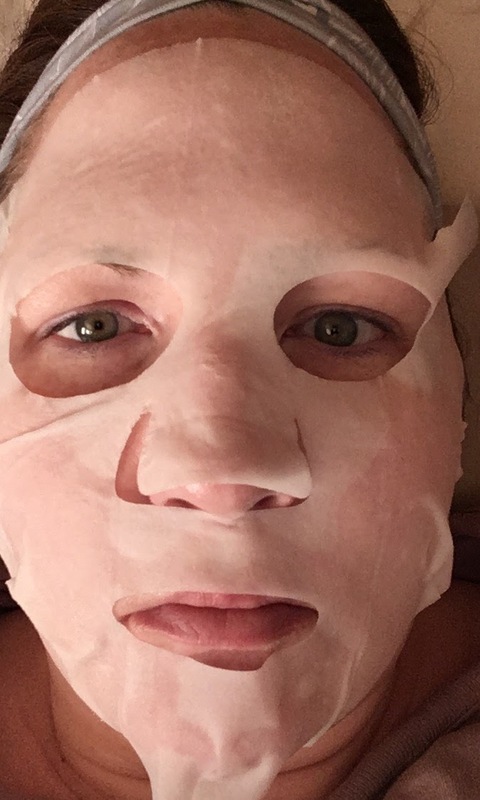 Sheet masks can have just about anything infused into them. 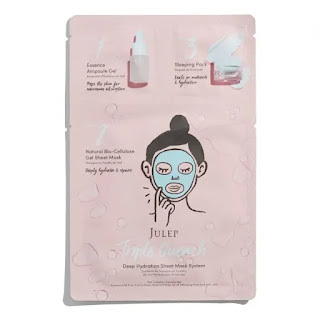 I was lucky enough to score a preview of the NEW JULEP Triple Quench Deep Hydration Sheet Mask System from Preen.me. This next generation sheet mask consists of three parts. It makes a complete hydrating at-home facial: in one packet. The system instantly reveals softer, brighter, plumper-looking skin in just 15 minutes. It doesn't contain any artificial colors or fragrance. This mask is recommended for dehydrated, normal and dry skins. To use: once or twice a week, treat yourself to an at-home facial. First use the Essence Ampoule Gel. Apply the lightweight Essence Ampoule Gel to freshly-cleansed skin. Let the gel sink into the skin. Second, apply the sheet mask (note: the all-natural bio cellulose gel sheet mask comes with a white protective mesh backing on both sides. Before applying the sheet mask. carefully peel one of the mesh backings and apply the gel side to the face, starting from the forehead. Then peel of the second backing and smooth out to the contours of the face. Leave on for 15 minutes. Remove sheet mask and pat any excess product onto skin. Third, use the Sleeping Pack. To seal all the goodness in your skin and the hydration from the Ampoule and Mask, use the sleeping pack provided in Step 3. Apply a thin layer of the lightweight cream all over your face. It absorbs quickly with no greasy or heavy residue. This makes it a perfect step before bedtime. I adored this "at-home facial". I say at-home facial in quotation marks because there are no extractions or steam and no exofiation with this facial. I am a licensed Esthetician after all. But I will say that this is a great way to add instant and lasting moisture to your skin. I would highly recommend purchasing these masks in the 3-pack if you suffer from dehydrated or dry skin and find yourself in need of something to help pick up your skin (especially after the summer months in the sun). My favorite part? The sleeping pack. I am finding that these moisturizers/overnight masks are making great creams for overnight use and they really do work wonders on the skin. Only a country as great as South Korea could come up with a name as Sleeping Pack for skincare. Because let me tell you, those creams are good. They work wonders on the skin. When you wake up, skin is glowing, bright and "happier". Definitely invest in one. JULEP makes a great one. The JULEP Triple Quench Deep Hydration Sheet Mask System is sold online at www.julep.com. Like JULEP on Facebook: https://www.facebook.com/julep; Follow JULEP on Twitter: @JulepBeauty; Follow JULEP on Instagram: https://instagram.com/julepbeauty; Follow JULEP on Pinterest: https://pinterest.com/julepbeauty/ and Subscribe to JULEP on YouTube: https://www.youtube.com/user/julepnailparlor.